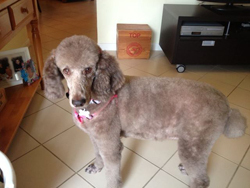 About Mattie Beautiful fun young cocoa-colored standard poodle who is very very sweet. She is used to being 'on the street' so she is not housebroken. She is FUN and FUNNY as she learns to live with humans again. Mattie's Ideal Home: Mattie needs a home where someone has the patience to teach her potty training and how to live 'indoors' again. She is very smart. She is an escape artist so definitely needs a fenced yard. She gets along well with other dogs. Mattie's Favorite Things: Loves her foster mom. Is just learning to play with toys. Seems to like the soft animal ones. Current Health: Excellent health; recently spayed.